This week’s Playful Puppy WOW Card is really super cute! It features a punch out of Bullseye the Dog to put together and even come with a Target Logo Frisbee Disc or doggie bone for him to play with. 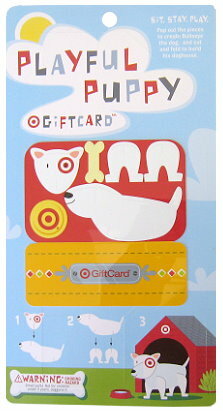 To make it even more fun- the cardboard backing for the gift card has a red dog house to be cut out and folded up to make a home for him! 🙂 This adorable gift card is sure to make anyone smile and the best part is it will come loaded with $50 for the winner to spend! $50 shopping spree at target would be great! I love Target! Would love a gc to use with my coupons. Love to win. Thank you for sharing all the deals. Thank you for the giveaway! I <3 target! i think if i were to win this one i would spend it on k-cups for my new keruig! Thank you for all of your tips! I have been using and will continue using them. You rock, Totally Target!! Really really want to win! Love the weekly giveaway thanks! This would help with the new grandson on the way. I like you on db and I love Target! I already ‘Like’ TT on facebook! Thanks for the giveaway. I spend a lot of money at Target. I Love this website and all the money I have saved using it!